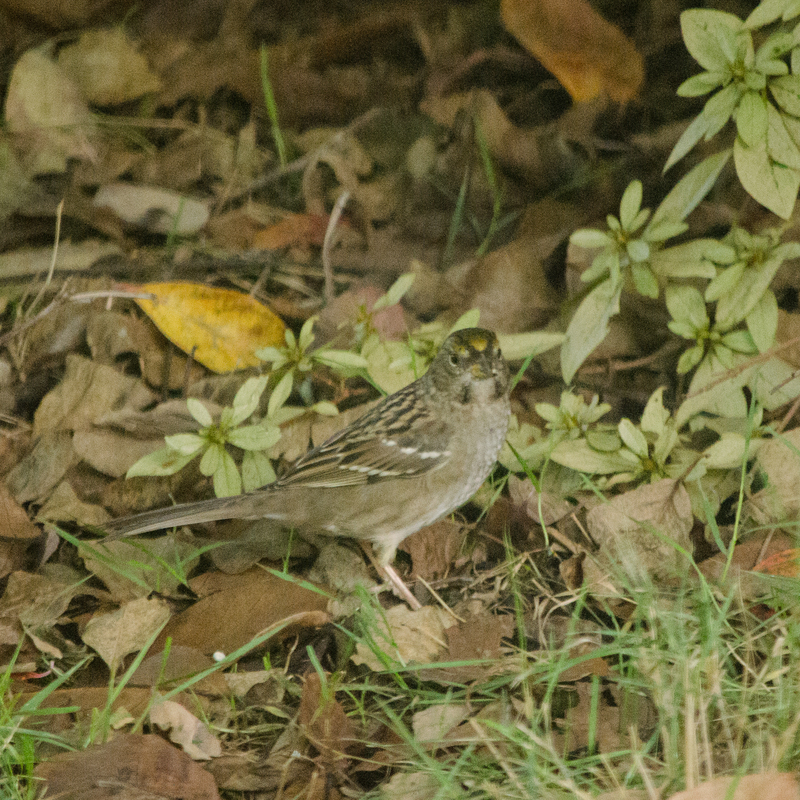 Sparrow identification can be tricky, as the different species can be very similar to one another and they will intermingle in fall and winter flocks. They also don’t tend to hold still very long, often only providing a glance at the markings which allow for identification. Golden Crowned Sparrows are fairly common at my yard feeders, especially in the fall and winter; I can almost always find at least one or two hunting around even if the seeds have run out for the moment. They tend to stay in or close to low-hanging branches for cover, and keep their bodies low in the grass when on the ground foraging. These little brown birds get their name from the yellow feathers adorning their heads. In the winter, this tends to be duller and less obvious, but it is still present. The darker stripes running the length of the skull are black in summer but mottled with brown and less obvious this time of year. While watching them the other day, one caught my attention when I noticed a peculiar feature: white eyebrows extending back from a dash of yellow feathers. This was clearly someone new! 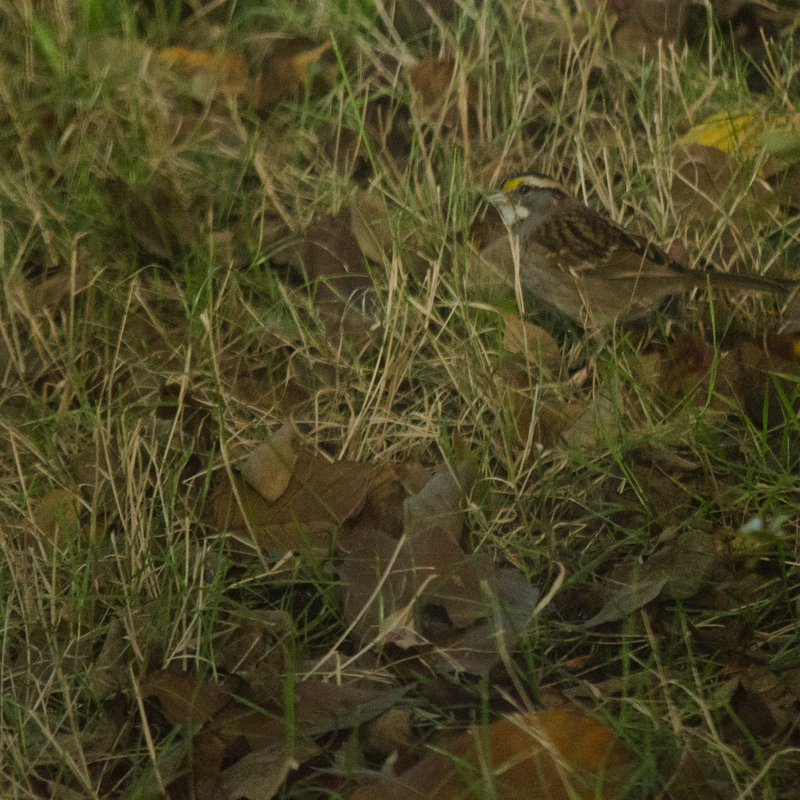 A bit of time spent in close observation revealed another telling feature: a patch of bright white feathers on the throat, lending the bird it’s name: the white throated sparrow. The general coloration of the bodies on these two bird species is very similar; they are largely brown, with dotted wing bars and pale colors on the breast and belly. 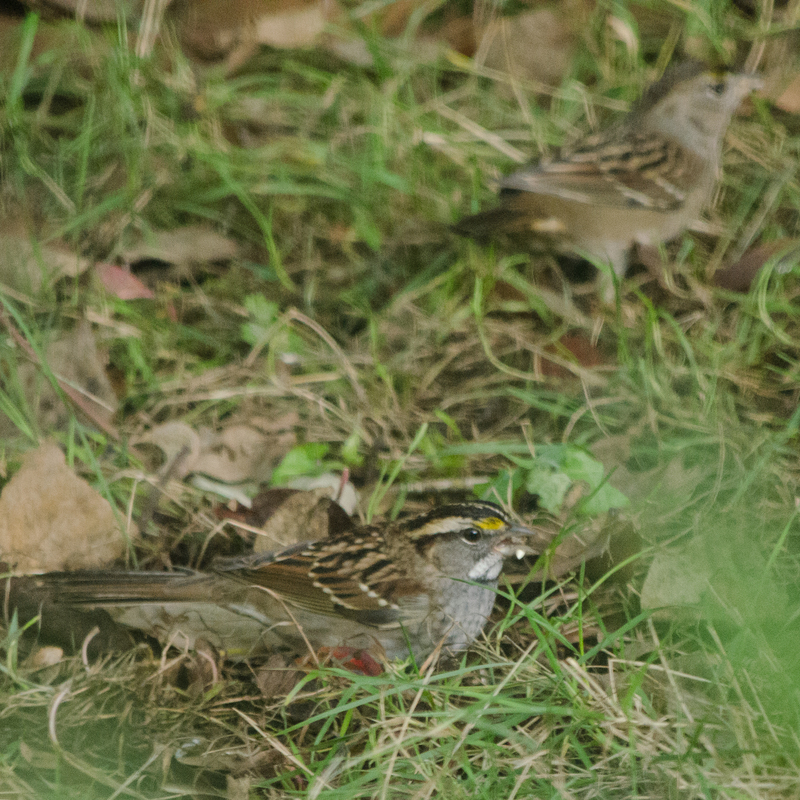 They will intermix with the also-similar white crowned sparrow (which at first glance was what I had thought the white throated sparrow was, except that they lack the yellow feathers on the forehead). A clear look at the head and facial markings is a must for positive identification of these little fellas! To see more of my images, be sure to visit my Flickr site! Comments are always welcome, both here and there.